The period in Britain in the early 20th century, about 100 years ago, is called the Edwardian period, after King Edward Vll who reigned from 1901 to 1910. Take a video tour of a country house from Edwardian times. See inside Highclere Castle, the country house setting of the television series "Downton Abbey", a period drama set in the early 1900s. View a painting of an Edwardian woman dressed in the fashion of her day. Visit an online exhibit about dolls' houses from the 17th century to the present day. 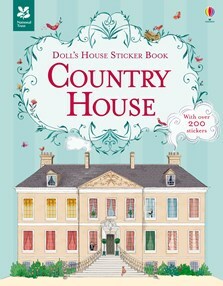 A traditional doll's house in sticker book form, with the grand, decorated rooms of an English country house from the Downton Abbey era a hundred years ago, just waiting to be filled with furniture and accessories. With over 200 stickers of beautiful furniture, delicious food and delicate chandeliers and china, children will have hours of fun arranging furniture, setting the table for lunch, hanging pictures on the wall and stocking the pantry shelves. Scenes are presented in a pleasing upstairs-downstairs format, with the housemaid’s room above the nursery and the cellar and china store below the kitchen. Other rooms include a beautiful conservatory, her ladyship’s bedroom and a well-stocked library. Includes internet links to find out more about life at the beginning of the 20th century. Published in association with the National Trust. A delightful sticker book, both fun and educations... This will keep youngsters entertained for quite a while. perfect when visiting English country residences!